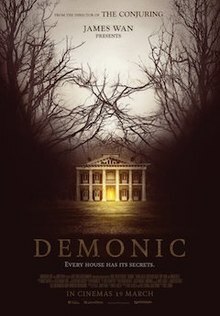 I already reviewed Satanic; might as well go ahead and review Demonic while I’m at it. The movie is fairly ambitious in that it wants to try to blend together found footage, standard horror, police procedural, flash back/forward, unreliable narration, and a host of other things. While the abundance of storytelling tropes are blended together in such a way as to not be entirely terrible, which is pretty impressive by itself; the movie suffers from a lack of focus that can take one out of the film and lessen the tension of a given scene. The plot of the movie centers around a house where 20-odd years ago, someone went crazy and killed a bunch of people. Then a group of ghost hunters come back to the house to see if they can find some evidence of the supernatural. The plot jumps back and forth between the past events of what happened in the house and the present where a detective is interviewing what appears to be the only survivor in order to find out how all those people died. There is some found footage in the present as they look back on what happened but also it just jumps back to the past when interviewing the guy but then also sometimes it just jumps back for no reason. Anyway, not all is as it seems and there’s some spooky twist ending stuff. I really wish that they had stuck with one or two narrative conventions instead of trying to cram everything all at once. Probably the police detective side because they managed to snag Frank Grillo for the role and he does a good job. Also, the six people that go into the house aren’t really distinct enough for me to care and, honestly, when they mentioned six people I literally couldn’t think of all six because one of the guys is so bland that I just combined two of the people into the same person in my head. The only downside to the police side of the story is that it feels so much safer and everything has already happened so when it cuts back to it from the past story, all the tension that was building in the haunted house just dissipates while we follow around the detective. The scares in Demonic aren’t terrible, though it tends to rely fairly heavily on jump scares. That isn’t necessarily a terrible thing when a movie can at least build up to them and then use it as a release. The problem is when it’s an out-of-nowhere shock scare where they just try to startle you and call it a day. Again, due to the back and forth nature of the film, we don’t really get to develop a lot of the setting and get attached to it. When bad things do start happening to the characters we already know the outcome of it and we just aren’t all that attached to them to begin with. Without the investment in the plot and characters, even a decently filmed and directed movie like this is going to end up not gripping the audience. I’d give it a 2 out of 5. It’s technically proficient and not exactly bad per se but it certainly doesn’t have anything really going for it that makes it worthwhile. Diabolic tomorrow? * Or go full Planescape 2e and watch Tanar’ric? And Baatez…ic? Baatezuic? Yugolothic? * I assume there are multiple movies called Diabolic/k but I don’t know anything about any of them and wouldn’t want you to subject yourself to them just for the joke.